We are excited to be chosen as one of the top 20 most promising collaboration technology solution providers of 2017 by CIOReview. We won the award under the Boomtown brand, but the product that won was the Relay platform. 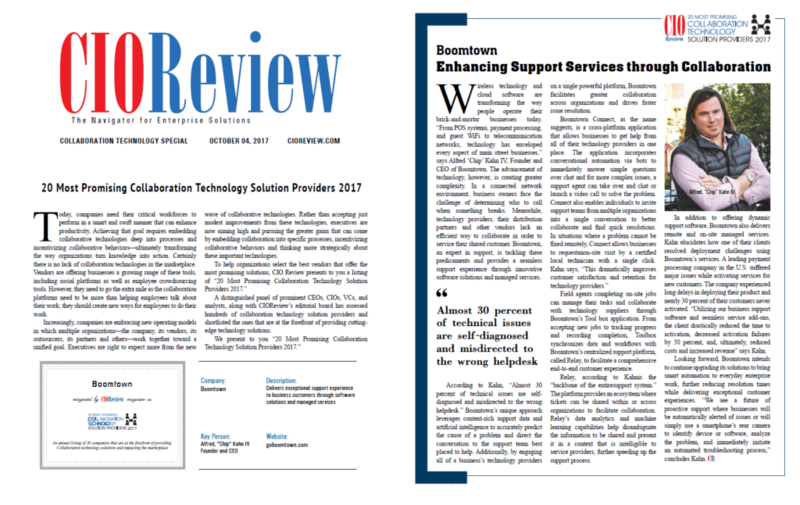 A distinguished panel of prominent CEOs, CIOs, VCs, and analysts, along with CIOReview’s editorial board has assessed hundreds of collaboration technology solution providers and shortlisted the ones that are at the forefront of providing cutting-edge technology solutions. Almost 30% of tech support issues are self-diagnosed and misdirected to the wrong helpdesk.